Paula Scher began her design career at Atlantic and CBS Records in the 1970s. 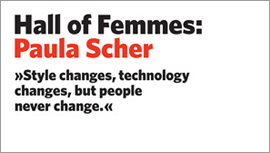 In 1984 she co-founded Koppel & Scher, and in 1991 she joined the design firm Pentagram NY as a partner. Paula Scher has worked with identity and branding systems, environmental graphics, packaging and publication designs for a broad range of clients. In 2001 she was awarded the profession’s highest honor, the AIGA medal, in recognition of her contributions to the design field. In 2006 she was awarded the Type Directors Club Medal.